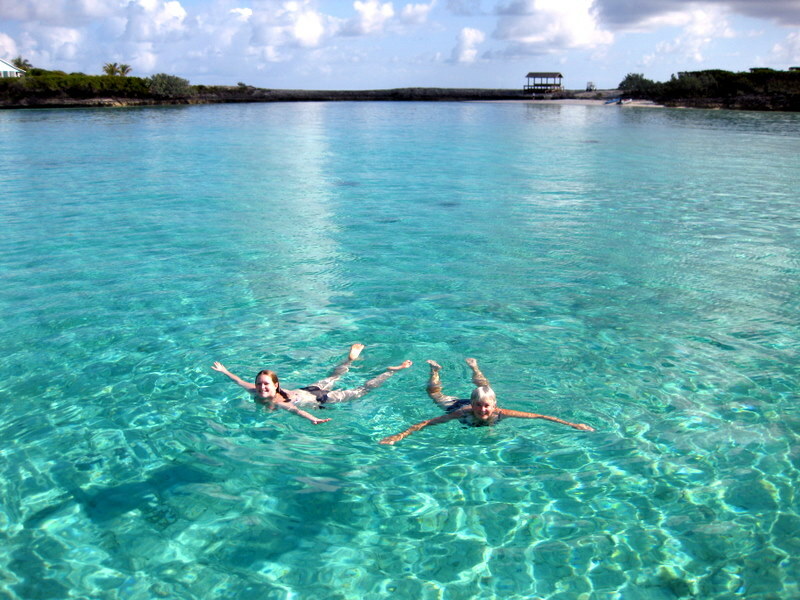 We’ve been bouncing around the sea of Abaco like the ball in the video game, Pong – Treasure Cay to Guana Cay to Man O War Cay to Hope Town to Marsh Harbour. They are all so close together it’s like running to the 7-11 when you run out of milk. So, it was an easy run from Hope Town to Marsh Harbour to pick up our daughter, Carrie, after her flight from Vancouver/Toronto/Nassau/Marsh Harbour. Great to see her and lovely to show her our winter home. It was her first visit to this boat. We had been visiting with our cruising buddies from Azaya and Kolibrie (both big teacher families) and so we were excited to introduce our teacher, Carrie, to them. After Carrie’s first night at anchor in Marsh Harbour, we met up with our buddy boats at our special spot north of Man O War harbour. Boy, someone has a mombo linksys router set up there and so we enjoy great internet. One night we downloaded the movie, “The Best Little Whorehouse in Texas” – one of our favorites. In the water at our spot! 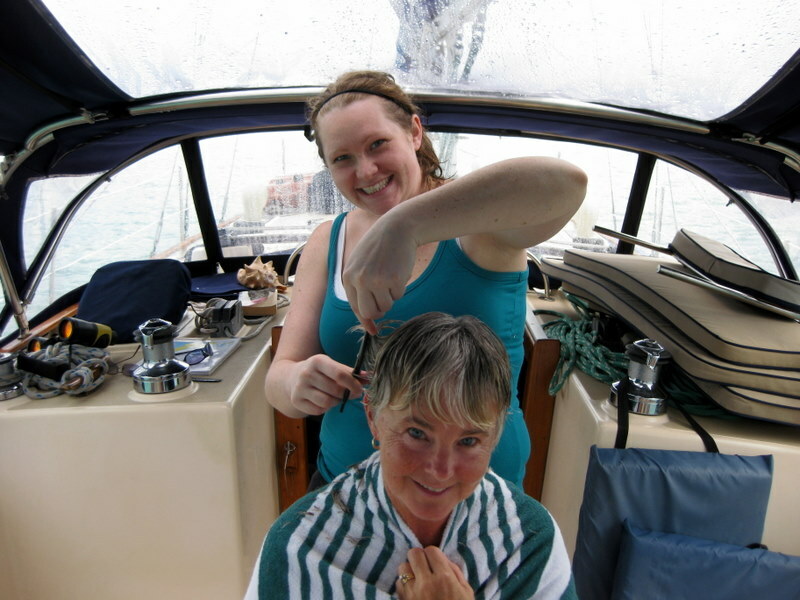 Pam had been dying for a hair cut (see previous posts about hair cut disasters in the Bahamas) and was thrilled when Carrie offered to cut her hair. There were envious glances from other lady boaters when they saw the result. Thanks, Carrie!! Carrie is a fairly strict vegetarian but told us that she would compromise herself on our behalf during her visit. So we had lobster on our first night! We’re sure she felt some guilt but we know she loved her dinner. 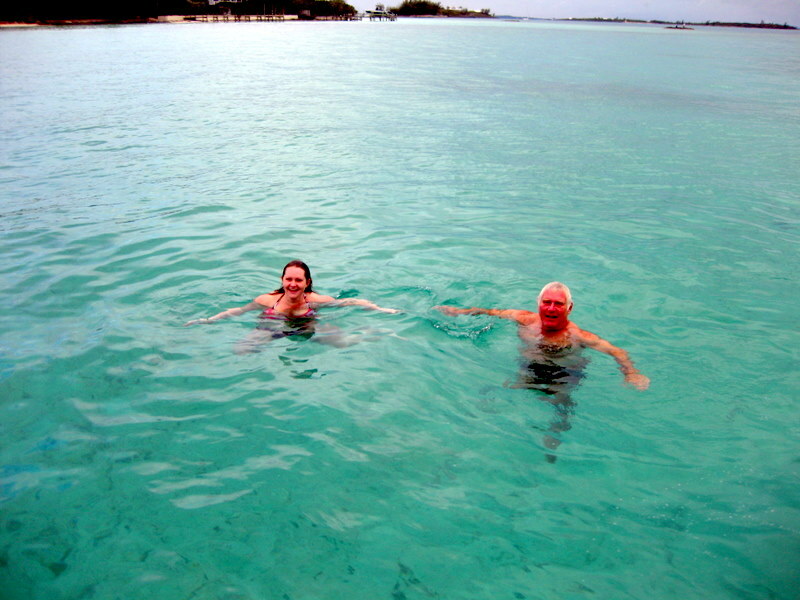 We spent a couple of days at our Man O War spot enjoying the great internet, swimming, snorkeling, reading, visiting the town and meeting Lola and Martin who run Lola’s Bakery. 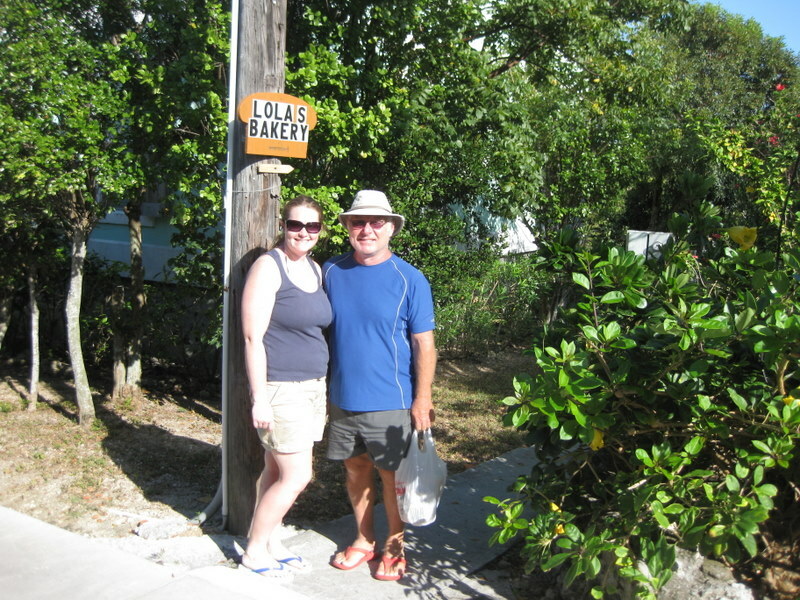 We bought bread, home-made guava jam and conch fritter batter from them. 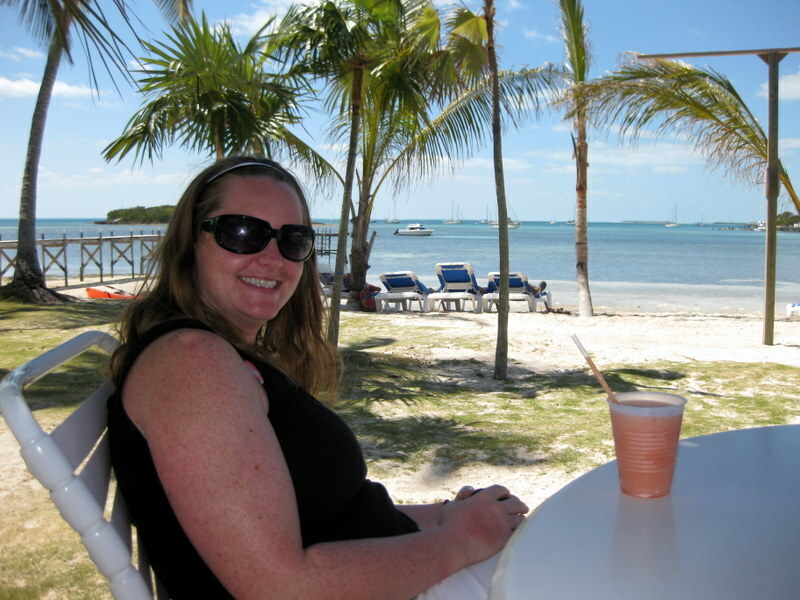 We also returned to their home to buy beautiful $5 conch shells for Carrie to take home. 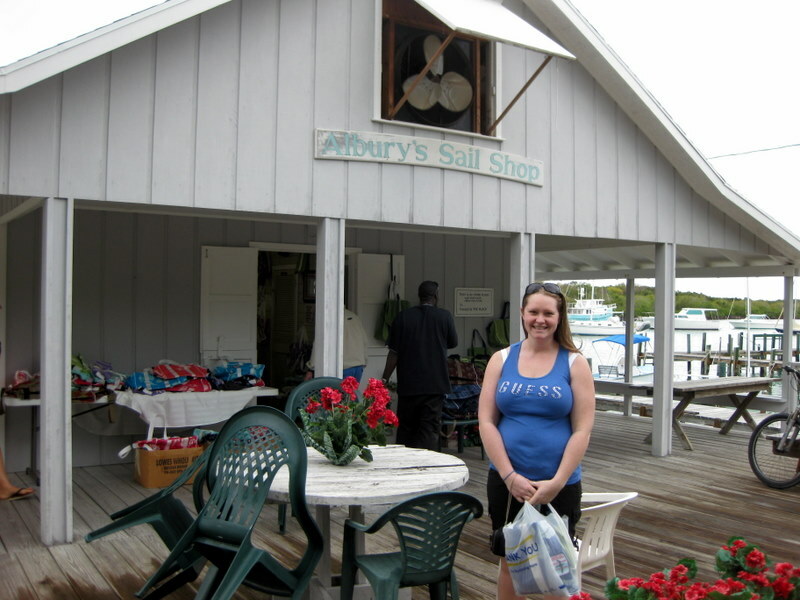 We took Carrie to the Albury Sailshop and had her pick out a bag. We hope she doesn’t have to return it in 30 years like Glen did with his (see our last blog post). We took a run up to Great Guana to show Carrie the hotspots there - Grabbers and Nippers, where she had a frozen Grabber and a frozen Nipper and plunged into the surf off Nippers Beach. Glen was thankful that the scantily clad spring break coeds weren’t there this week. 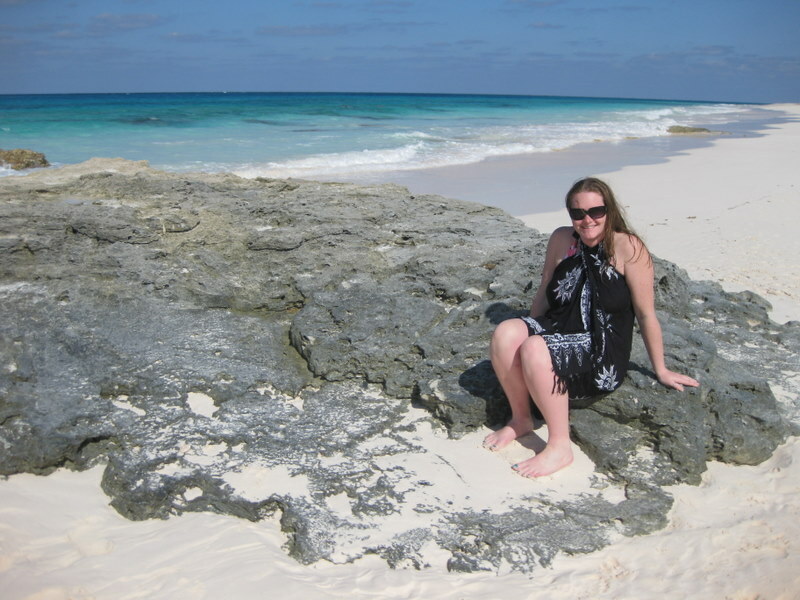 Hope Town, only 12 miles from Great Guana is an amazing place. It seems to have been adopted by American ex-pats. There is a huge amount of energy coming from the place and the harbour is PACKED with boats. It is a perfect hurricane hole and very scenic. When we were there in ’79 there were about 8 boats anchored in the harbour. There must be more than 30 now. 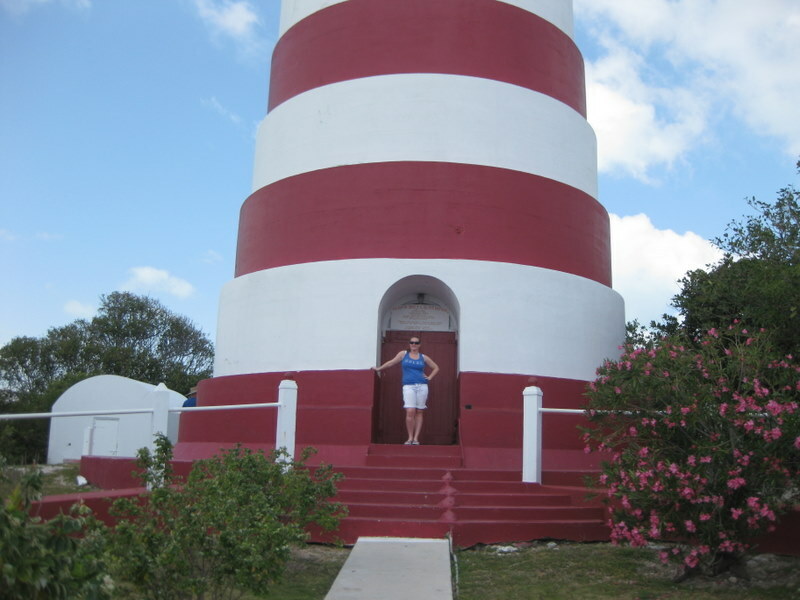 We walked about the town, bought more lobster tails, looked in the gift shops, admired the Atlantic beaches, enjoyed the pool next to the marina and climbed the lighthouse – one of a few Fresnell lens lighthouses remaining, and stared at the view. 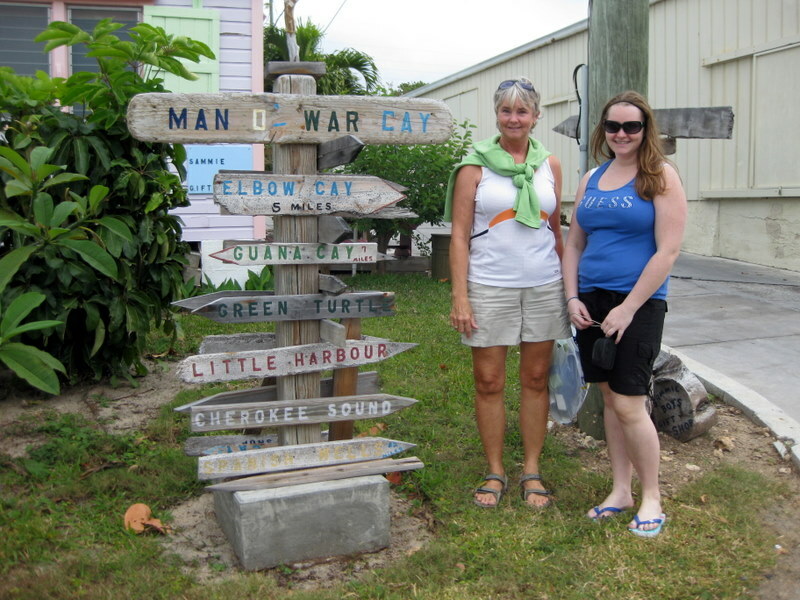 One day we rented a golf cart and toured around Elbow Cay, where Hope Town is located. We saw more beautiful Atlantic beaches, visited a cool bar and restaurant and walked on the incredible Tahiti Beach at low tide. Great shelling and beach walking. 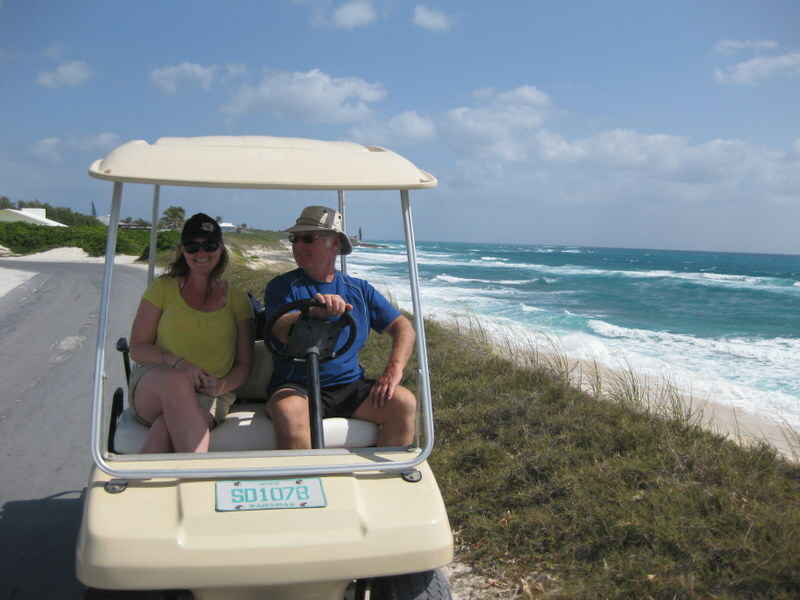 We travelled up and down every little roadway and lane on the island in our golf cart. Carrie bought a conch shell prepared as a ‘conch horn’ in a shop in Hope Town and was by far, the best heralder of sunset in any anchorage we visited. 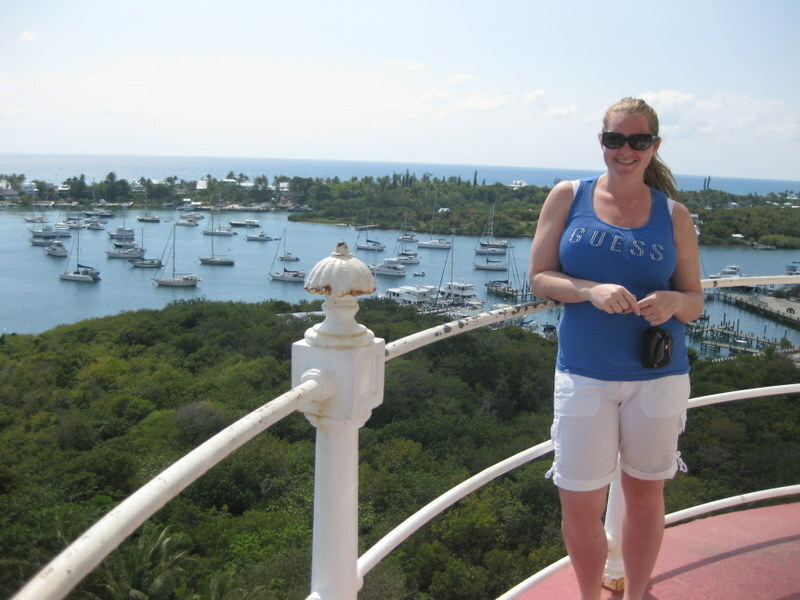 Carrie had to catch an obscenely early flight out of Marsh Harbour to Nassau to make her Toronto connection so we anchored in the harbour just off Curly-Tails Restaurant to put her into a taxi at 6:00 AM. Back to bed for us but it was the beginning of an epic, snow impeded trip back to Vancouver for Carrie. She called us at 8:00 AM our time (5:00 her time) the next day to say she had just finally arrived home. It’s windy here… but no snow. As always, when someone leaves us we have a slow day, adjusting to being alone again. We are so glad that Carrie could be here and enjoyed our time with her immensely. She has returned to Chilliwack to her busy life with Jesse, friends, Emily the dog, and work. 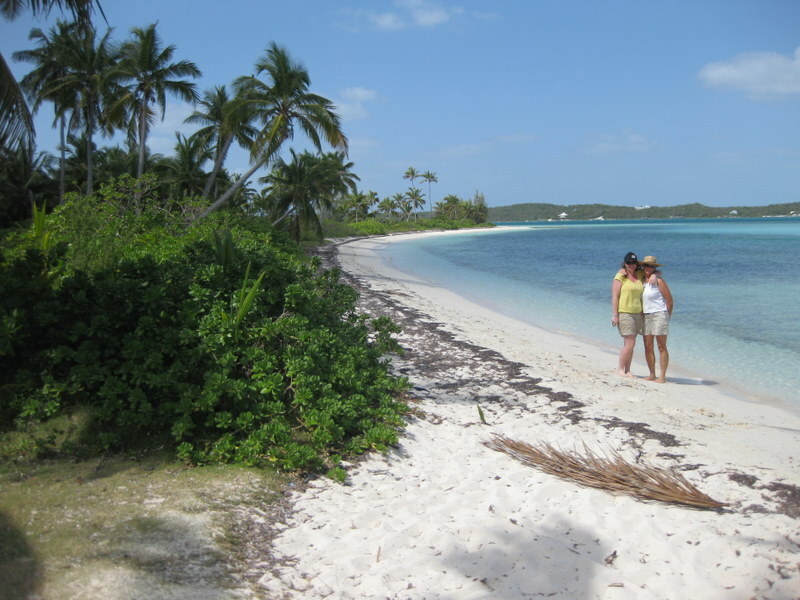 So, we are going to continue to PONG back and forth around the Abacos until George and Deb Keys arrive. We’ll give them the whirlwind tour and then head north over the top of Grand Bahama and cross back into Florida. What a lovely visit you had with Carrie, I'm glad she was able to meet you at your 2nd home. It was great to meet up with you two again and finally get to meet your daughter Carrie too! Hope you're enjoying Green Turtle - Great place! It's only been a week, but it feels like a lifetime ago! I reread this to remind myself that it wasn't too long ago that I wasn't as tired as I am right now. Back into the swing of things with the grade ones, I think I might have finally broken some of their bad habits, so hopefully the rest of the year will continue to get easier. I had a fantastic time and loved getting to see you guys. Can't wait for you to come home. Love you both and thanks for such a great trip. Hi guys, I somehow missed this last entry of Carries adventures, super shots tho and many special times. Enjoy your remaining days of sun and sand, it's sure awful here. It'll get better tho??? ?